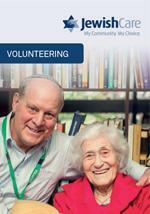 The Volunteer Program offers volunteers excellent opportunities to gain new skills, network and socialise with other volunteers and staff as part of a meaningful volunteer experience at Jewish Care. An informal opportunity for volunteers to catch up with Volunteer Resource Program staff as well as other volunteers over 'a cuppa and cake'. held regularly and bringing staff and volunteers together, these lunches offer an excellent opportunity to meet motivational guest speakers over a catered lunch. A full-day workshop familiarising new staff and volunteers with the fundamentals of Jewish lifestyle. Ethos Day includes lunch, guest lectures and a trip to the Jewish Museum or Jewish Holocaust Museum and Research Centre. Cultural Events: Based around Jewish holidays and public commemorative days, events for staff and volunteers are run by our Jewish Life team. Organised by the Volunteer Program staff, these events include festival packing bees, Mitzvah Day activities and National Volunteer Week celebrations. So too, many programs and facilities organise their own volunteer parties and events throughout the year. Held annually to celebrate exceptional contributions of staff and volunteers nominated for service and excellence awards.